Keynote speaker Mayor Michael Newhard awarded the Chosen American Eagle Award for integrity in leadership. 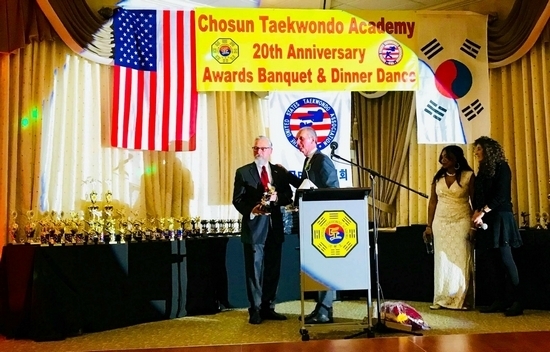 WARWICK — The Chosun Taekwondo Academy, a local martial arts and hatha yoga center located at 60 Galloway Road in Warwick, hosting its 20th anniversary Awards Banquet and Dinner Dance at Mineral’s Resort & Spa in Vernon, N.J., on Saturday, Dec. 9. Two-hundred fifty students, friends and honored guests braved the early snow for an evening of merriment and to honor members who have achieved significant gains over the current year and the past decade in taekwondo, the traditional martial art of Korea. The Five Tenets if TaekwondFollowing dinner, a 20-year retrospective video and a brief speech by Chosun-owner Grandmaster Doug Cook, Warwick Mayor Michael Newhard inspired the crowd by connecting the Five Tenets of Taekwond – courtesy, integrity, perseverance, self-control and indomitable spirit – with virtues taught and practiced by Chosun students. He then went on to thank the family-run Chosun organization for providing the citizens of Warwick with authentic instruction in the martial arts and hatha yoga, in addition to supporting local charities through their community outreach programs. The mayor then accepted the Chosun American Eagle Award for integrity in leadership. The remainder of the evening included a visit from Santa, a silent auction to benefit the Warwick Historical Society and dancing to the sounds of DJ Ming. For further information on the programs offered by the Chosun Taekwondo Academy, call 845 986-2288 or visit online at www.chosuntkd.com.